After hours spent on the cast off with several hundred stitches, I finally finished the Mara shawl which is free on Ravelry. The 2x2 rib is not as long as suggested in the pattern but I was concerned about enough wool to cast off. The double rib uses twice the number of stitches in the single rib and is done by knitting front and back in every stitch except the two at each edge. Then, the increases continue with four in every second row. When I decided I would be cutting things fine, I had over five hundred stitches on the needle and each row was beginning to be quite a drag. 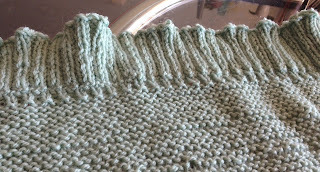 The picture shows the edge unblocked. It took ages to cast off as it was done loosely. Purl two together and place the resulting stitch back on the left needle. Purl two together and so on. The cast off is loose and stretchy but was tedious. Here is a larger picture. The shawl is still unblocked here. Cleckheaton Country which I had from another shawl which I had ripped out. It is a soft gum leaf green. It feels very cosy and I often appreciate the warmth around my shoulders of such a shawl. Winter has been very cold, and while today is spring like, having this finished gives me a feeling of satisfaction. That satisfaction's increased by a spot of mending I also did this morning. Several years ago I bought a commercial pure wool cardigan. It was on special and I could not have bought the yarn for the price I paid. It has been very good inside and has been worn a lot. It is a good weight and handy to grab and put on. To my horror I was out for a birthday, (mine), pizza when I discovered a big hole in the elbow of right sleeve. After finishing the shawl I found some sock yarn in a colour which would be Ok with the cardigan. I made two patches, big enough to cover the worn area and have sewn them on. It does not look wonderful and will mean the cardigan is purely house wear, but it has extended its life and usefulness. The tulips are from a birthday bouquet for my birthday and that is indeed the colour they were. Son has his daughters here this weekend although they are out at the park now. It is a beautiful mild, sunny spring day here today after a week of horrible weather and floods in many areas. Miss M had another good report from her fortnightly oncology clinic so we are happy with that. Getting any breakfast into her is hard. This morning we had a treat of some very good bacon. She had four substantial rashers and an egg. It took forty five minutes for her to eat that, so much must have been cold. When she was finished she asked if she could have an Up and Go which son keeps for emergency breakfasts if he has little time. They claim to be the equivalent of two weetbix. She drank that, so had a substantial start to the day. When they arrived last night, Big Sister washed her hands and made nachos for us all. She was very efficient and had her meal worked out well for everything to be ready together. I haven't had nachos for some years, and totally enjoyed her cooking. 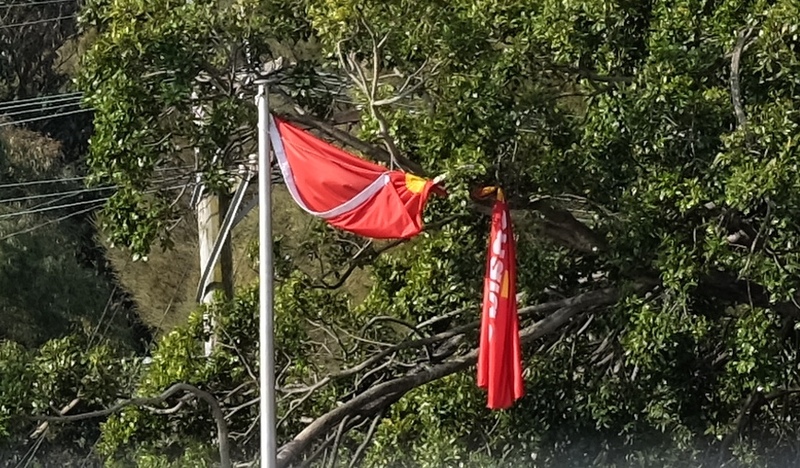 I thought the wind had ripped the McD's flag in two. 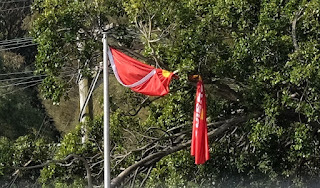 It is actually knotted by the wind around the branch of the large Moreton Bay fig. It has been there like this for a week. As the branch is over the main road, I think a cherry picker would be needed to free it, rather a ladder against the branch. Wind was a gale, very unpleasant. Happy birthday to you Jan. I'm a September birthday too and I like very much that my birthday is in spring. Isn't it so nice when someone cooks for you. Yes, happy birthday and beautiful flowers. The shawl is lovely and I do that cast off too, it is tedious but a very good one. Oh no, a hole in your favourite cardi. I am loath to let go of things if they can be fixed and not worn outside the gate!! Glad to hear that Miss M is still doing well, you must be very happy.